Meet Quay Dash, a 25-year-old New York rapper. Editor's note: This is the final part in a three-part series on women in the hip-hop industry. In the last few decades, hip-hop has risen to become a multi-billion dollar industry. It was a woman who led the production of the first commercially successful rap track. However, the industry remains unquestionably male dominated. Female rappers usually enjoy less success than men. A new generation of female emcees, however, is building on the legacy of women in the industry. Meet Quay Dash, a 25-year-old New York rapper. She describes her music as real and raw. Dash has always been one to speak her mind, she says. And she has always had a mouth. "I’ve always been the one to express myself…,” she says. Her sound pulls on the “90s golden-era rap music,” which Quay Dash says she listened to religiously growing up. Her music is also inspired by modern female rappers, like Remy Ma. “...She’s another female rapper that I’ve always looked up to that I was just like, ‘wow, she’s spitting some hard stuff. This is what I want my music to sound like, real explicit, real raw, like you know, a punch to the gut." Dash says she first decided to take her music career seriously when she was about 20. The self-named “Queen of NY” became involved with a music collective. Later, she decided to leave the group for other opportunities. “Things come and go, and now I’m doing my own thing,” she says. Now, she is a self-managed artist. That means she does everything herself. Her photographer and videographer, Serena Jara, helps her get things done, too, she says. I don’t care where you go, don’t care how you look// I will never like a post or a pic on the book. The song is part of her first EP, called “Transphobic.” It was released in 2016. It tells of her lived experiences as a black, transgender woman living in America. “Those five songs that’s on that EP I just wanted to get it out there and have people listen to it and relate to whatever stories or whatever lyric that I spit on those tracks." Dash says that the message behind "Transphobic" was one of self-love. For her and others in the trans community, society can be one of their biggest barriers. “This is a world where society just kills and you have to be strong enough to just get past that…,” Dash says. Dash says that her music has made a difference her community. “It definitely has made an impact within my community, you know and definitely in the music industry and I’m glad to have gotten it done." Her music has earned her an international following. She notes her recent tour in Australia. “I just feel like, everybody was definitely into it. Everybody was giving me my props and was proud to see a black, transwoman rap and travel the world." Dash says the general lack of attention female rappers receive is why she does what she does. 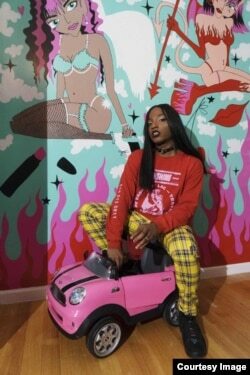 “There’s not many females out there getting as much play as male rappers, and I feel like there definitely, definitely needs to be more of a presence in the female rap community. That’s why I’m here making ‘herstory’ by putting out music and being the best I can be in my role." Rachel Dennis reported and wrote this story. Ashley Thompson was the editor. herstory - expression. ​ history told or considered from a female or feminist perspective.